The problem with the smartphones, laptops, and tablets of our day is that the tools are multifunctional, but the energy that powers them can’t be divided up by function. Well, until now. Harvard graduate student Wonyoung Kim has unveiled a prototype device that could change the way that processing chips receive power, and eventually lead to slimmer smart-tools, and longer lasting batteries. 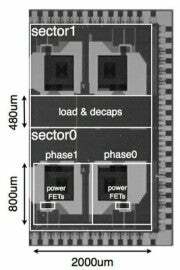 The device is a “multi-core voltage regulator” whose on-chip design helps it allocate voltage to different processors with greater precision. That way, if you’re not using your graphics processor but you’re listening to music, power to the graphics processor gets cut off. And look! You’re already saving energy! Kim’s MCVR is basically a tiny DC-DC converter with an algorithm to detect with parts of the chip that are not in use, taking all the energy from a 2.4V source and powering parts of the chip down to a range between 0.4V and 1.4V. It could certainly have an impact on how mobile phones are built, allowing extensions in battery life or maybe even smaller batteries. Kim also imagines that his MCVR could reduce the heat output of laptop processors and possibly break a barrier for slimness in the market. That way, you can eventually hide your laptop from view simply by turning it on its side. Ah, the future!